Social scientists now know a lot about what goes with happiness. 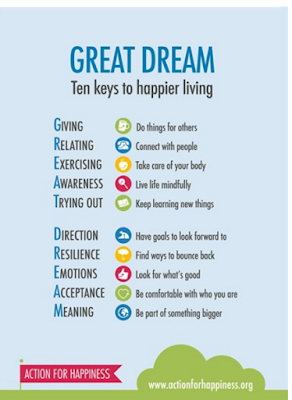 Positive Psychology has identified a number of simple interventions which lead to lasting improvements in happiness. However, even among educated people these are little known. 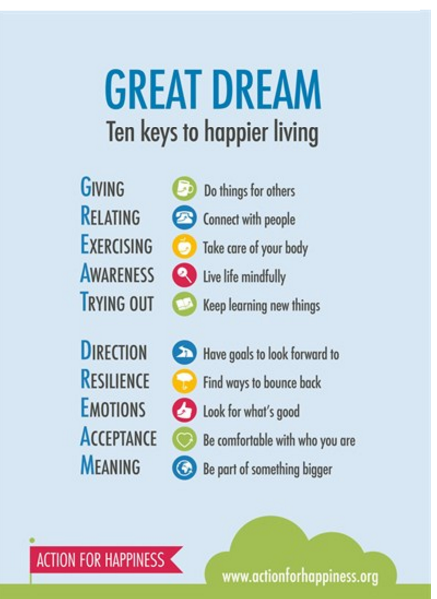 Do you know these 10 strategies to enhance happiness designed by Action for Happiness? Governments can – and should – promote knowledge about happiness and incentivise activities that promote happiness – such as exercise, clubs and games– just as they have begun to do with the environment and physical health. It was no coincidence that the UAE gave the WGS a happiness focus, organised a Global Happiness Dialogue and a happiness festival in the same week and is also the first country in the world to appoint a Happiness Minister. Which country is going to be the second? Vannesa King, a board member at Action for Happiness and author of the Ten Keys to Happier Living, who was also present at the WSG, argues that it should be the UK. #6 The need for wise leadership: Can Dubai be the Florence of the 21st Century?